​Humanists & Freethinkers of Cape Fear; Triangle Freethought Society, Raleigh; Military Atheists & Secular Humanists, Ft. Bragg; Charlotte Atheists & Agnostics; Hickory Humanist Alliance; People’s Park Foundation, Asheville. Fairfax Freethinkers; Northern Virginia Chapter of WASH, Arlington. ​Congregation Beth Adam, Boca Raton; Central Florida Freethought Community, Winter Park; Humanist Community of the Space Coast, Melbourne;Humanists of North Central Florida, Ocala; Humanists of Sarasota Bay; Free Inquiry Group of Southwest Florida, Ft. Myers; Congregation for Humanistic Judaism, Sarasota; Tampa Humanist Association; UU Humanists-Clearwater; First Coast Freethought Society, Jacksonville; Center for Inquiry & Tallahassee Freethinkers Forum. Birmingham Temple, Congregation for Humanistic Judaism; Secular Student Alliance, Ann Arbor; Mid-Michigan Atheists and Humanists, Okemos; Grand Traverse Humanists; CFI Grand Valley, Allendale; CFI, Grand Rapids. May 20, Humanist Association of Las Vegas. 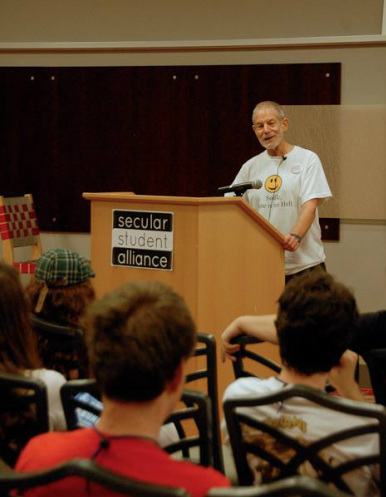 Congress of Secular Jewish Organizations, National Conference, Keynote Address; Workshop on Secular Activism. DragonCon Skeptrack, Atlanta Hilton.Talk at 4 PM Aug 31, Book Readings at 1 PM on Sept 2, and on three panels. Greenville Unitarian Universalist Fellowship,1135 State Park Road. 11 AM Sermon on Positive Atheism to GUUF. October 26, 7:30 PM, Candidate Without a Prayer: Autobiography of a Jewish Atheist in the Bible Belt at Kol Hadash Humanist Congregation in Deerfield. October 27, 3:30 PM discussion on Humanist Community Building to the Ethical Humanist Society of Chicago, 7574 N. Lincoln Ave, Skokie. October 28, 10:30 AM talk at same location to the Ethical Humanist Society of Chicago on Tales from the Bible Belt. ​January 30, 2019, 7:30-9 PM discussion at Veritas Forum, California Polytechnic State University, with Dr. Karen Swallow Prior, from Liberty University, on the topic: Would Society be Better Off Without Religion? January 31, 7:30 PM at San Luis Obispo Senior Center, 1445 Santa Rosa St, Atheists United, SLO, Candidate Without a Prayer.